Today’s teenagers are busier than ever, running from school to sports to activities to part time jobs. With all these things to do, their diet can suffer. Whether they are stopping to grab a sugary soft drink and some cupcakes at the gas station or taking a trip through a fast food drive-thru, our teens may be missing out on the nutrition they need to fuel their bodies and brains. Make eating right as easy as possible with these easy tips. There are a wide variety of healthy options that already come packed and ready for on-the-run eating. Things like yogurt, string cheese, and packages of nuts all come pre-packaged in individual servings. Have these grab-n-go options available to make it as easy as possible for your teen to eat right. Energy drinks and sugary soft drinks may provide a momentary boost of energy due to their sugar and caffeine content, but all those empty calories will leave your teen crashing in no time. Make sure they have easy access to portable water and other low calorie beverage options. While the single serving snacks from the store are handy, they can really break your budget and may not appeal to your teen’s taste buds. Try creating your own pre-packaged snacks that feature the foods your teens likes most such as a half sandwich of choice in a sandwich bag, or a ziploc bag of sliced fruit. The best snacks are those that provide your teen with the energy they need to do what has to be done before the next meal. Snacks that combine a carb like a cracker and some protein like peanut butter are the most energy efficient. Make sure your teen has access to these kinds of power-packed snack options. Start their day off right by making sure they eat breakfast before they leave the house. Eating breakfast ensures that their brains and bodies will have the energy they need for school. 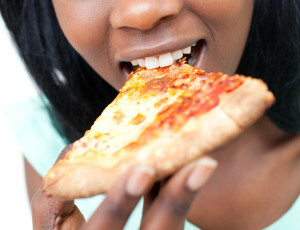 Even nonbreakfast foods such as dinner leftovers can be offered to picky eaters. Don’t forget about apples, oranges, bananas, grapes, and other fruit that also comes pre-packaged in a single serving size. While fruits can be high in sugar, they also offer other nutritional components that make them a win for busy teens. The busy schedules of our families’ means that many nights we are not all home at the same time to have a nice sit down dinner. This only makes it harder for teens to get the food they need to fuel their active lives. Rather than sticking to a set dinner time, delay dinner so that everyone can have a good home-cooked meal together. If delaying dinner isn’t an option or if a delay would make your main daily meal fall too late at night, promote breakfast to your family’s main meal instead. It is more likely that everyone will be home at the same time early in the morning which means it is easier to get everyone around the table for some healthy food and family bonding. Many teens find themselves in the impossible situation of being squeezed between their biological clock, which makes it impossible to go to bed before 11 or 12 at night, and early morning school start times. This means they aren’t getting the sleep they need for good health. Studies have shown that when we are overtired we are more likely to crave and choose sugary, salty, high-fat foods. Helping your teen find ways to get the sleep they need can make it easier to avoid temptation and improve their overall health and wellbeing.